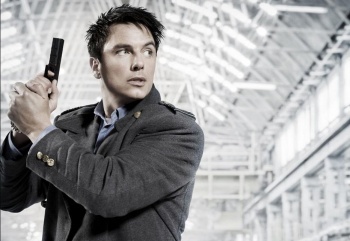 John Barrowman is ready to return to Doctor Who, but he needs your help to do it. John Barrowman, perhaps better known to sci-fi fans as Captain Jack Harkness, says that he would love to be a part of the 50th birthday celebrations for Doctor Who in 2013, and wants any fans who would also like to see him back in the TARDIS to let the BBC know. Captain Jack Harkness first appeared in Doctor Who in 2005, as a companion for Chris Eccleston's ninth Doctor. Harkness died in a conflict with the Daleks in the 201st century, but was brought back to life by a time-vortex-infused Rose Tyler, rendering him effectively immortal in the process. Abandoned by the Doctor, he joined - and later led - Torchwood, safeguarding the Earth against the alien threats that the man in the TARDIS wasn't around to deal with. Speaking to BANG Showbiz, Barrowman described Harkness as an "integral" part of the Doctor Who story, and said that it would be a shame if he wasn't involved in the anniversary. He said that it wasn't a case of whether or not he wanted to come back to the show - he said he'd do that at any time - it was whether or not the BBC wanted him to come back. "I've said to all the fans, you need to write to [the BBC] if you want it to happen because I've never been asked," he said. I know Russell [T Davies] thinks it might be a nice idea, as did [Doctor Who showrunner] Steven Moffat but who knows?" Considering that there are literally years - albeit only just - before the anniversary, Barrowman is really starting his campaign early. It could be that the BBC does want Jack to come back for the anniversary, but plans to ask him nearer to the time.